There will be one last race to determine the winner of the 2013 America’s Cup. Oracle Team USA prevailed and won both races yesterday, moving into a tie from the brink of elimination and forcing one last race. 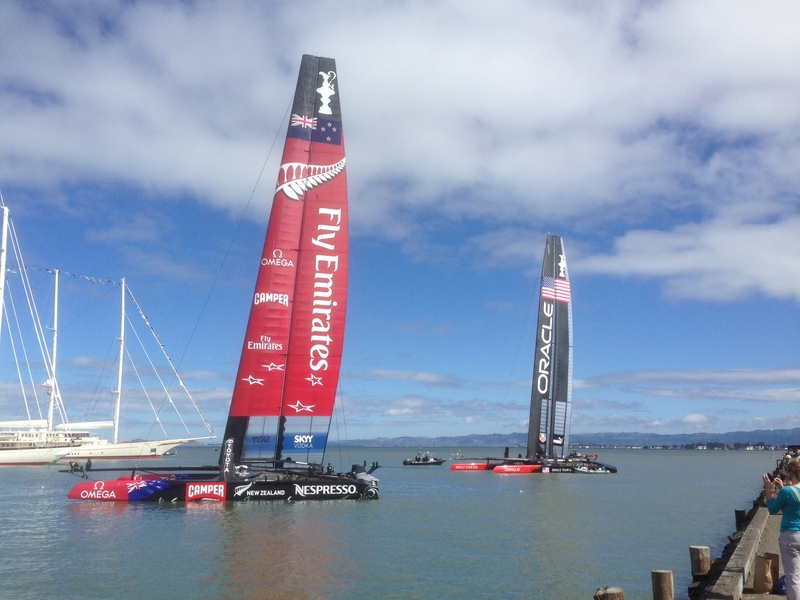 From a score of 8 – 1 Oracle Team USA has sailed their majestic catamaran to tie Emirates Team New Zealand with a score of 8 – 8. Written off as losing, the sailing team of Oracle Team USA worked hard and stayed positive. Today was the showdown. Who would emerge victorious? Under sparkling sunny skies and wonderful winds, the stands were filled and America’s Cup Park and the entire waterfront was crammed with people. Lining the hills above the Bay and the walkway on the Golden Gate Bridge, sailing aficionados began arriving early to find viewing spots on the beaches and sea walls. Excitement was mounting and the crowds were amazing. People everywhere were carrying and/or wearing their national flags. It was not just an event for sailors but the majestic catamarans with 72 foot high sails had captured everyone’s attention and hearts. Non-sailors were as enthusiastic as sailors and it was an extraordinary event on the San Francisco Bay. Under the gaze of the Golden Gate Bridge, Oracle Team USA sailed to victory to capture the 2013 America’s Cup and keep it in the USA. It was an exciting and thrilling race and an event to be remembered by all who were lucky enough to be a part of it. As the Oracle Team USA crossed the finish line, cheers erupted and the fire boat began spewing water in the air – a truly San Francisco event. There are so many sorry to see it finish and we will miss the daily excitement! Congratulations to the phenomenal competitors! Too much wind. Too little wind. Wind blowing in the wrong direction. Rain. Tides too strong to sail in. The San Francisco Bay has presented challenge after challenge to the America’s Cup final races. Excitement and build-up have been tempered with disappointment and cancelation as Mother Nature spoke. Today, under sunny skies, the Golden Gate Bridge will again watch over a race. If the tides and winds cooperate, Emirates New Zealand will have a chance at victory and winning the coveted America’s Cup. They need one more victory after suffering disappointment yesterday and Friday. Oracle Team USA must continue to win each race to keep the America’s Cup. Fans are once again out on yachts, sail boats, ferry boats and charter boats. They are lining the bridge, hills, beaches and waterfronts and America’s Cup Park is alive with excitement. The boats head out to race. Who will win? Emirates New Zealand? Oracle Team USA? The wind? The tide? 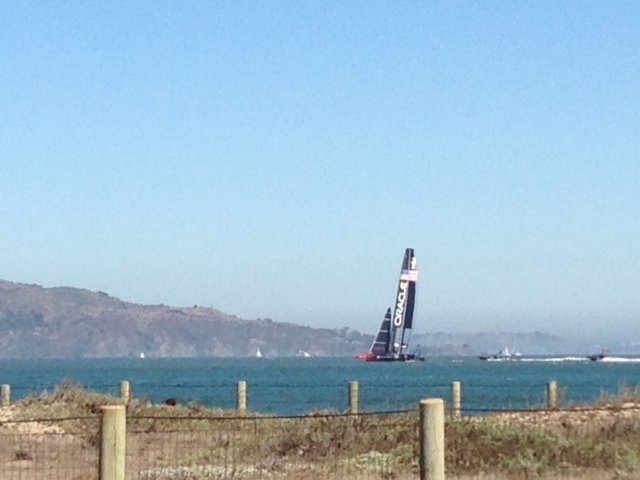 LAST RACE OF AMERICA’S CUP? The yachts and sail boats began to arrive. The Coast Guard cutter appeared. People began to fill the stands and bayside and the beaches were filled with onlookers. Hills above the Bay were lined with onlookers and the Golden Gate Bridge pedestrian walkway was full. There was even an American flag. Ferry boats and other charter boats filled with fans with cameras and gazing in anticipation sailed the San Francisco Bay. Would this be the last day of America’s Cup racing? 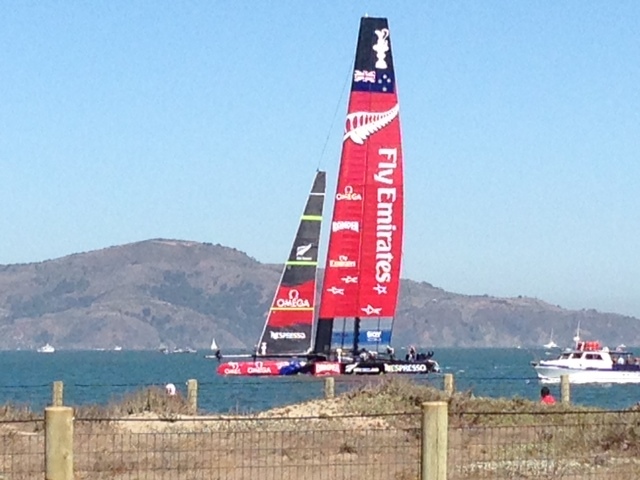 Emirates New Zealand needed only one more victory to win the coveted America’s Cup. Could Oracle, the American boat, win another race? As the race marker buoys were towed into their race locations, excitement began to mount for perhaps the final race of the 2013 America’s Cup. San Francisco Bay sparkled under beautiful sunny skies and the Golden Gate Bridge looked on. The majestic catamarans appeared for their practice runs. First the red sail of Emirates New Zealand sailed regally by the crowd an then the American Oracle glided gracefully past Alcatraz and the fans erupted in applause and shouts. The race that followed was exciting and fast. Oracle was victorious and the catamarans will race again tomorrow. One victory from elimination, each race is a must win for Oracle. 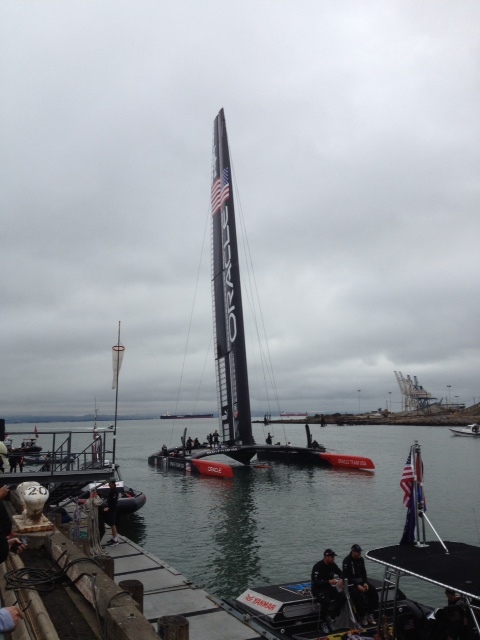 One victory from capturing the America’s Cup, the New Zealand boat is poised to pounce. What will tomorrow bring? 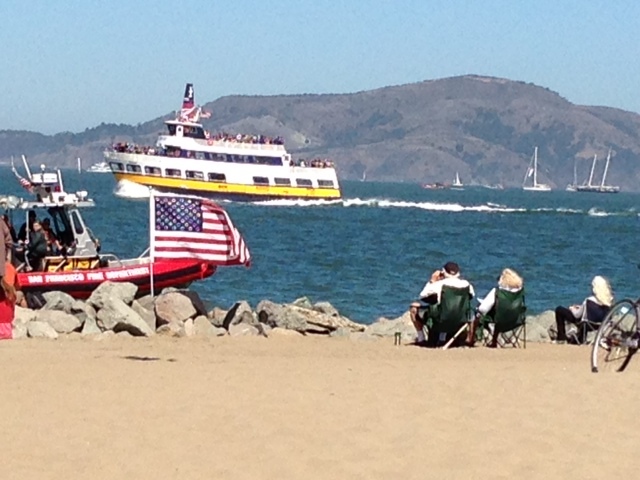 What a beautiful sight on San Francisco Bay! 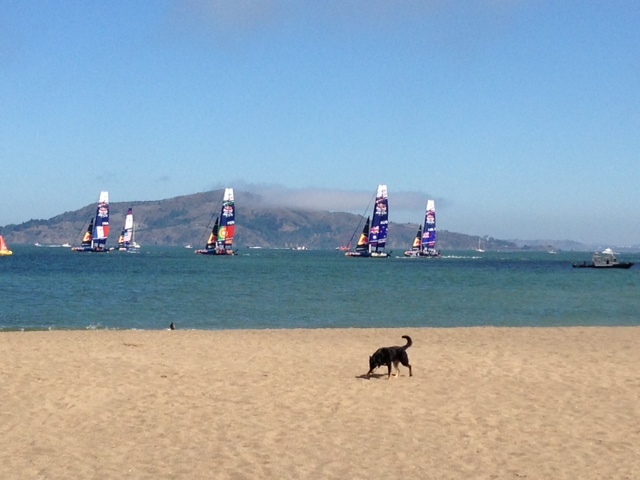 Under sunny skies, the Red Bull America’s Cup Youth Race continued today. 10 Catamarans with teams from around the world glided across the water. While smaller than the majestic catamarans Emirates Team New Zealand and Oracle vying for the America’s Cup, these catamarans are beautiful, graceful and colorful. The team members are ages 19 to 24 and it is so impressive to watch the skill with which they handle the catamarans. Fans lined the waterfront and beaches to watch. You are currently browsing the Powerhiking's Blog blog archives for September, 2013.